Joan Miró rejected the constraints of traditional painting, creating works “conceived with fire in the soul but executed with clinical coolness,” as he once said. Widely considered one of the leading Surrealists, though never officially part of the group, Miró pioneered a wandering linear style of Automatism—a method of “random” drawing that attempted to express the inner workings of the human psyche. Miró used colour and form in a symbolic rather than literal manner, his intricate compositions combining abstract elements with recurring motifs like birds, eyes, and the moon. “I try to apply colours like words that shape poems, like notes that shape music,” he said. Joan Miró Ferra was born on April 20, 1893, in Barcelona. At the age of 14, he went to business school in Barcelona and also attended La Lonja’s Escuela Superior de Artes Industriales y Bellas Artes in the same city. Upon completing three years of art studies, he took a position as a clerk. After suffering a nervous breakdown, he abandoned business and resumed his art studies, attending Francesc Galí’s Escola d’Art in Barcelona from 1912 to 1915. Miró received early encouragement from the dealer José Dalmau, who gave him his first solo show at his gallery in Barcelona in 1918. In 1917 he met Francis Picabia. Miró’s first major museum retrospective was held at the Museum of Modern Art, New York, in 1941. 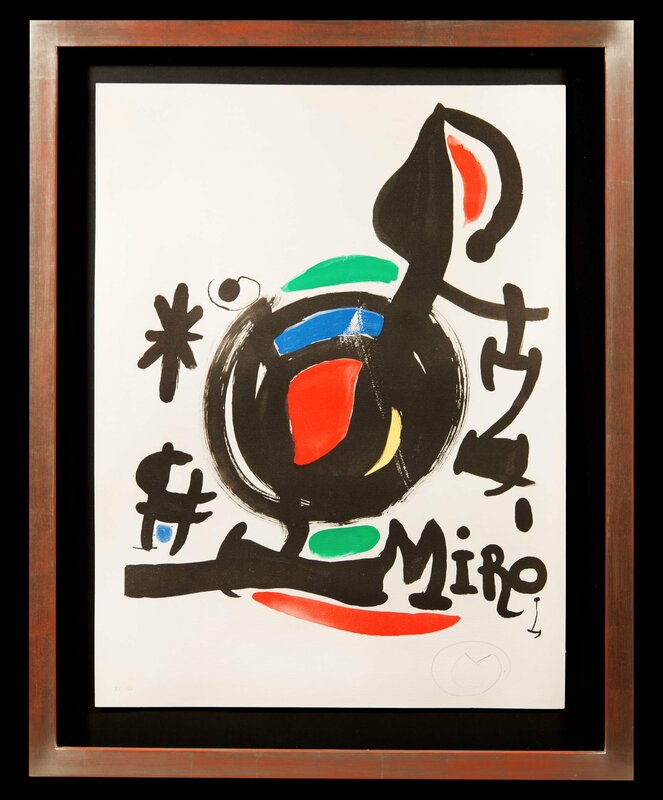 In 1944 Miró began working in ceramics with Josep Lloréns y Artigas and started to concentrate on prints; from 1954 to 1958 he worked almost exclusively in these two mediums. He received the Grand Prize for Graphic Work at the Venice Biennale in 1954, and his work was included in the first Documenta exhibition in Kassel the following year. In 1958 Miró was given a Guggenheim International Award for murals for the UNESCO building in Paris. The following year he resumed painting, initiating a series of mural-sized canvases. During the 1960s he began to work intensively in sculpture. Miró retrospectives took place at the Musée National d’Art Moderne, Paris, in 1962, and the Grand Palais, Paris, in 1974. In 1978 the Musée National d’Art Moderne exhibited over five hundred works in a major retrospective of his drawings. Miró died on 25 December, 1983, in Palma de Mallorca, Spain.